President Obama’s speech at the National Defense University today was another exercise in misdirection and illusion regarding the administration’s unprecedented use of drone military strikes that have killed more than 5,000 people, the majority of whom were civilians, including a large number of children. Under pressure from a growing international grassroots protest movement demanding the end of drone strikes and the closure of the Guantanamo torture center, Obama’s speech was crafted to address both issues. He acknowledged that civilians were killed by his drone strikes and said that he would be “haunted” by their deaths, but he made it clear that the strikes would continue. Although he spoke far more eloquently than George W. Bush, the president used the Bush-created legal architecture to permit the president to kill anyone, anywhere if he labeled them as a terrorist. Obama said that his previously secret “legal basis” for targeted killings was actually the Authorization of Military Use Force (AMUF) that Bush rammed through Congress shortly after the September 11, 2001 attacks. Demagogically he called again for the closure of Guantanamo, which has been labeled a torture center by the United Nations. He said that the failure to close the facility was seen by the whole world as a “flouting [of] the rule of law” by the United States. 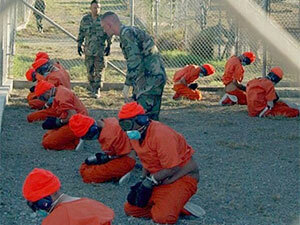 But he neglected to say that he has refused to use the vast authority of the presidency to actually close Guantanamo. Rather he is placing the blame on Congress rather than acting. For almost the entirety of his presidency, Obama has sought to shield his “War on Terror” policies from even some of the most basic scrutiny. In fact, information on many of these programs has only been released after significant criticism has been raised. More than anything, President Obama’s May 23, 2013, speech must be seen as a direct response to the individuals and organizations who have consistently been challenging the actions of the administration on these issues. It is unavoidably clear that the firestorm of criticism around drone strikes, Guantanamo Bay Prison, and the extent of domestic surveillance created a climate in which Obama was forced to defend his policies. The president outlined a number of policies, many of which had already been revealed in their broad outlines, and attempted to give them a new gloss. Further, the president made several statements that seem to be contradicted by his actions. In other words, despite all the hype, the president is attempting to codify many of the “war-time” measures that erode our civil liberties and perpetuate imperialist brutality abroad. For instance, President Obama claimed that his administration has “banned torture” despite the fact the force feedings being carried out by individuals directly under his purview have been classified by the American Medical Association as torture. The president also made several interesting admissions, one being that in the Afghanistan-Pakistan theater the U.S. government reportedly only attacks leaders of Al-Qaeda. Whether that is true or not, it is a clear admission that in Pakistan and Afghanistan, “signature strikes” – which have been responsible for thousands of deaths, including many civilians – will continue. “Only 55 known militant leaders have been killed in Pakistan, representing just 2 percent of the total deaths” caused by U.S. drone strikes in Pakistan, according to the New American Foundation. President Obama, in response to major criticism, did state the need to close Guantanamo; the president also stated that he wants to find a way to eliminate the Authorization of the Use of Military Force as a justification for terror policies. This is after he used the AUMF to conduct a mostly secret worldwide conflict that has killed tens of thousands of people. It seems highly convenient that, after such a huge amount of damage and suffering were caused, in retrospect the president criticizes the AUMF. While there is much to dissect in his speech, the bottom line is that President Obama is attempting to respond to criticism of his war on terror policies while creating a new framework to institutionalize many of these same policies.